For years, la Coupole has boasted the most famous lamb curry in Paris, simmered to perfection under the direction of chef Paul Delbard in the ultra modern kitchens that were revamped when it was acquired by Jean-Paul Bucher in 1988. The 32 painted pillars that mark out the immense dining room are still faithful to their post, and for the vast celebration organised for its 70th anniversary, la Coupole paid tribute to the artists of these pillars, students of Matisse and Fernand Léger. 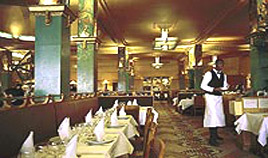 From the world over, people come to wallow in the unique atmosphere of this brasserie where people-watching is a timeless pastime. Copyright ® 2005-2009 paris-restaurants.net Rights reserved - Website dedicated to Paris Restaurants Reviews and online booking - Page about La Coupole restaurant in Paris.